Tendons are bands of connective tissue that connect muscles to bones. The Achilles tendon runs down the back of your lower leg, connecting your calf muscle to your heel bone. It’s the tendon that allows us to walk by raising our heel off the ground. If the Achilles tendon becomes inflamed (swollen), it’s known as Achilles tendonitis. Generally, the inflammation is short-term, but this doesn’t mean the problem doesn’t exist. Over long periods of time, if the Achilles tendonitis is not treated it will progress into a condition known as Achilles tendonosis. Pain develops gradually with Achilles tendonitis, but when it occurs it is described as a sharp, shooting pain, a burning pain, or a piercing pain. If left untreated, it can develop into a worse condition, and your tendon may weaken and even rupture. It’s important to remember that Achilles tendonitis is a slow developing condition. In most cases, the pain is mild in the initial stages but worsens over time. There are three stages to Achilles tendonitis, and all have their own sets of symptoms. Peritenonitis: This is the first stage. Most people do not experience any symptoms during this initial period, but some do feel pain during activities or while resting. Tendonosis: This is the second stage. Many times, swelling begins during this stage, as well as hard knots of tissue that begin to form on the back of the leg. Peritenonitis with Tendonosis: This is the third stage. At this point, the tendon may partially or complete rupture and the condition can prevent ones legs from walking, and a patient may require extended recovery periods. Athletes are very prone to developing Achilles tendonitis, especially runners. In fact, 18 percent of serious runners experience this condition at some point in their lives. But athletes aren’t the only ones who suffer from this condition. Improper footwear is often the cause of foot problems. In the case of Achilles tendonitis, a good example would be a woman who wears high heels for the first time in a while. The unfamiliar stretch and shortened position of the tendon can cause stress, and Achilles tendonitis can develop. Regularly performing activities that require movement with sudden stops can also increase your risk for recurring Achilles tendonitis. Other times, people develop this condition because they are prone to it. Some people walk abnormally, which causes their legs and feet to rotate unnaturally, which can lead to Achilles tendonitis. While diagnosing a patient for Achilles tendonitis, the usually routine steps are done first, including learning a patient’s history, giving a physical exam, measuring the passive ranges of motion of the feet, ankles and knees and by giving one or both of the following tests. The Thompson test detects ruptures within the Achilles tendon. Usually the patient will lie face down, bending the knees as the doctor’s press on the back side of the calves. If the foot flexes, it’s a tale-tell sign the Achilles tendon is at the minimum partially undamaged. Imaging tests may also be required. These usually involve x-rays, MRI scans, ultrasounds, or a combination of them. X-rays help detect swelling and fractures, while the MRI scan detects degenerative conditions in the tendons, and ultrasound can measure the Achilles tendon’s thickness. Achilles Tendon Stretch: While standing on a step (such as on a staircase), slowly lower your heel down over the edge of the step as you relax your calf muscles. Hold for about 15 to 20 seconds then tighten your calf muscle to bring your heel back up to the level of the step. Repeat 4 times. Calf Stretch: While standing in front of a wall, lean forward with one knee straight and the heel on the ground. Place the other leg in front on you with the knee bent. Push your hips toward the wall for a period of 10 seconds to stretch the calf muscle and heel cord. You should be able to feel the calf muscle stretching. Doctors recommend repeating this exercise 20 times for each foot. Surgery is usually used as a treatment option when all other non-surgical approaches fail to restore the tendon back to its normal condition or when symptoms are severe. 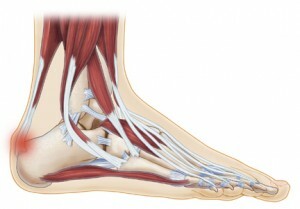 Surgery allows the surgeon to repair the damaged tendon. Patients who receive surgical treatment for a torn tendon typically need three to sixmonths of recovery from surgery. Can Achilles Tendonitis Be Prevented? The best way to prevent an Achilles tendon injury from worsening isnot to ignore the problem. If you injure this tendon, see a podiatrist or your primary care physician to begin treatment. This can prevent further complications such as immobilization and extended recovery time. What stage is my condition in? Will this become a chronic problem for me? Which warm up exercises do you recommend? Which over-the-counter orthotics do you recommend? Based on my condition, what is the long-term prognosis?